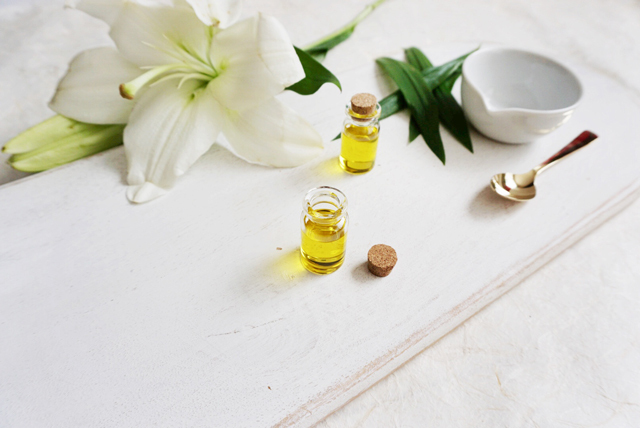 We’ve talked about some great plant-based oils in our Ingredient Spotlight series and to be honest, we could kind of go on forever because there are so many incredible, natural oils that do amazing things for skin. One that you might have heard less hype about is tamanu oil, a darker oil with a slightly greenish hue that OBC Skincare uses in a few of its formulations because of its powerful properties. Tamanu oil comes from the tamanu tree, which is native to tropical Southeast Asia. The tree grows up to three meters tall, with black bark, shiny leaves and twice annual blooms of white flowers. The flowers, after blooming, yield a cluster of yellow-skinned fruit that kind of tastes like an apple. The fruit’s inner nut contains a pale kernel, sometimes call “punnai,” which is dried in the sun for up to two months while it becomes sticky with a dark, thick oil. That oil is collected and cold-pressed to get tamanu oil, an oil rich in restorative, healing properties (natives to Southeast Asia used to believe it was a sacred gift of nature from the gods, as the oil protected their skin from hot sun, high humidity and the ocean wind). Tamanu is one oil that has been fairly thoroughly researched for its healing properties—it’s been shown to be one of the strongest remedies against scarring, stretch marks, dark spots and hyperpigmentation, making it covetable for skincare that targets signs of aging. One of the reasons the oil hasn’t become as quickly popular as lighter oils is likely due to its strong scent. It’s very herbal, with a hint of caramel, and can be too strong for some on its own. But in skincare formulations, the tamanu oil’s scent is diminished, leaving only its skin-healing effects behind. It’s antibacterial. That bodes well for a number of reasons and skin types but tamanu’s antibacterial powers make it great for blemish-prone skin, because it discourages bacteria from growing or forming in the first place. It’s a wound healer. Tamanu oil has been repeatedly shown to encourage healthy skin cell growth, meaning that it can treat skin abrasions and wounds when applied topically. This property makes it again ideal for sensitive or blemish-prone skin types, as tamanu helps skin regenerate and renew to reveal a clearer, calmer complexion. It minimizes scarring. Because tamanu speeds the growth of healthy skin cells, it also helps skin cells turn over, which reduces the appearance of scars and dark marks. When applied regularly to scars, stretch marks, hyperpigmentation or dark spots, tamanu oil diminishes discoloration and promotes a more even skin tone. It’s anti-inflammatory. And that means a lot when it comes to aggravated skin issues, like sensitivity, acne, eczema and more. Tamanu contains xanthone compounds that have been shown to reduce swelling and irritation when applied topically, and the callophyllolide that’s rich in tamanu seeds reduces tissue swelling and helps diminish histamine related skin responses. Translation: Tamanu oil helps reduce skin reactions or redness that can be caused by internal reactions to food or environment, as well as skin issues like acne. It’s an antioxidant. You’ve probably heard this word ad nauseam from natural and traditional skincare brands alike, but here’s what it really means: Tamanu oil helps inhibit the breakdown of cells after exposure to free radicals, like UV rays. Free radicals attack cells and can cause signs of aging, like wrinkles, sun spots and sagging skin. Tamanu jumps in to stop that breakdown from happening and can even help repair cells after they’ve been damaged. See why it’s a miracle oil? We vote for it to take over the beauty world next, right beside coconut oil! Try tamanu for yourself in OBC’s Nourish Night Balm, Nourish Day Oil and Nourish Night Face Oil.